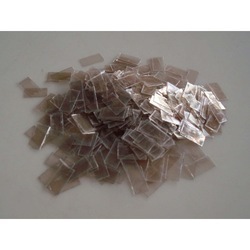 Fabricated Mica applies to cutting & punching of natural mica sheets to a specified shape and thickness for electrical and electronic end-uses. Most of the fabricated mica mechanisms are custom built against provided specifications and drawings. The fabrication is performed by using foot or power presses with the help of compound dies. The mica may also be hand-sheared & drilled. 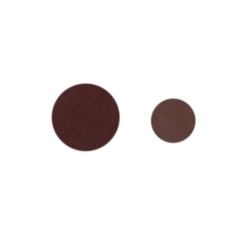 They are produced into innumerable designs varying in size, pattern, thickness and quality. Our range of fabricated mica comprises of mica discs, mica washer, mica condenser and backing mica. We offer Mica Condenser to our clients. Mica condenser are pieces of high quality mica having thickness generally less than 2 mils are classified as condenser films. 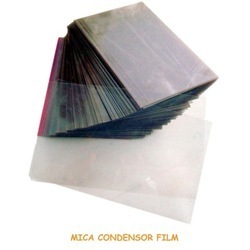 These films are used in the manufacture of silver mica plates used in mica capacitors. They are produced into innumerable designs varying in size, pattern, thickness and quality. We offer Mica Washer of all shapes & sizes to our clients. Mica washers are circular punched natural mica parts with round openings in the center suitable for electrical and electronic applications. Such natural mica washers can also be bonded into considerable lengths with epoxy or silicone binders to form a solid roll which is called bonded mica washers. 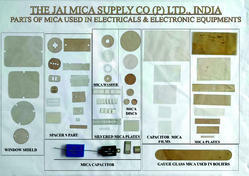 We customize Mica exactly as per Client's requirements and have an in-house tool room to make most complex dies. We offer Backing Mica to our clients. Small cut-mica sheets are effectively used as backing plate on both top and bottom sides of mica capacitors to give mechanical potency and inflexibility. The fabrication is performed by using foot or power presses with the help of compound dies. The mica may also be hand-sheared & drilled. Mica Sheets cut to different sizes and splitted in specified thickness range for basically Electricals & Electronics uses. We offer Mica Discs to our clients. Mica discs provides the best protection to spherical view port glasses and perfect visibility for checking the degree of combustion and liquid level in high pressure steam boilers. It is also used in breathing apparatus, geiger counters, communication devices, fuses etc. Looking for Fabricated Mica ?